BURLINGTON — A man wanted for questioning in an Iowa missing person case died from a self-inflicted gunshot wound early Monday evening as a manhunt began to close in on him in the southern part of Coffey County. Coffey County Sheriff Randy Rogers said 54-year-old James Snovelle, of Rolfe, Iowa, was raised on a farm in the Gridley area, and died one-half mile west and three-fourths mile south of the U.S. 75/K-58 Junction, near Gridley. At the request of the Kansas Bureau of Investigation and Iowa Bureau of Investigation, the Coffey County Sheriff’s Office began to search for Snovelle, who was considered to be a witness in the disappearance of a 50-year old woman, Dawn Allen, from Carroll, Iowa. According to Carroll police, Allen was last seen at about 7 p.m. Wednesday, May 4. Snovelle attempted to elude officers in a red 2000 Mercury Sable, but it became stuck. He fled on foot, and Kansas Highway Patrol K-9 units were used to track him. “As we closed in on him in an attempt to make contact and get him to surrender, he died of a self-inflicted gunshot wound,” Rogers said. The manhunt ended approximately 6:30 p.m. The search for Snovelle covered an area near the U.S. Highway 75 and state Highway 58 junction. Road blocks were set up to restrict traffic from the area. 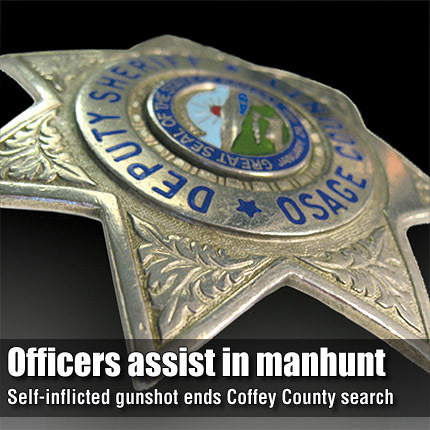 Many law enforcement officers participated in the manhunt, including special response teams from Coffey County, Osage County and the KBI. “He was believed to be armed and we weren’t taking any chances,” Rogers said. The Burlington Police Department also assisted with the search as did approximately 10 KHP units, a KHP helicopter and airplane and KBI agents. The vehicle Snovelle was driving was confiscated and is being processed for further possible evidence. The missing person case remains under investigation.